Liverpool welcome Exeter to Anfield on Wednesday evening as both sides prepare themselves for an important FA Cup replay. After playing the kids in the first clash between the two sides, Jurgen Klopp has hinted that he may well play the youngsters again. Injuries for Liverpool mean they are unable to call upon Philippe Coutinho, Martin Skrtel and Dejan Lovren. It would be unlikely however for that trio to feature in what could be another unfamiliar XI fielded by the Reds. For Exeter Paul Tisdale has little to worry about in terms of injuries after seeing several key players return in the fixture at St James' Park, it is expected that the manager will field another strong team. The last time the two sides met was of course on 8th January, Jerome Sinclair and Brad Smith were on the scoresheet that day and Liverpool for a vast proportion of the game looked like they were going out of the competition. Fielding a team with a grand total of 34 appearances so far this season was perhaps a questionable decision made by Jurgen Klopp on Friday evening but despite their weakened line up, Liverpool still managed to collect a draw at St James' Park. A spirited Exeter side took the lead in the fixture which looked extremely tentative at times for the Reds but goals from Brad Smith and Jerome Sinclair ensured a stay in the FA Cup. The home side found the back of the net after just nine minutes when Josh Read whipped in a lovely cross and Tom Nichols at full stretch managed to connect and convert. I can't say it was a shock really because the Reds had got off to a shaky start to say the least. This was a team that had never played together, apparently in the warm up Jurgen Klopp was running through technique and link up play with Benteke and Sinclair because they quite possibly didn't even know who each other were. It was crazy. Liverpool confidently put three past league one side Exeter last night as the home side only managed a consolation goal from the penalty spot. It was a high tempo clash and Exeter can hold their heads high I feel after getting stuck in for most of the 90 minutes. A lack of chances for the Grecians was perhaps the main thing holding them back, along with the class of Suarez and boot of Andy Carroll. Liverpool are now safely into the third round of the competition. The first 20 minutes saw both sides switching possession. Although Exeter were struggling to create chances they were certainly capable of making interceptions and flustering the Liverpool passing system in midfield on a few occasions. 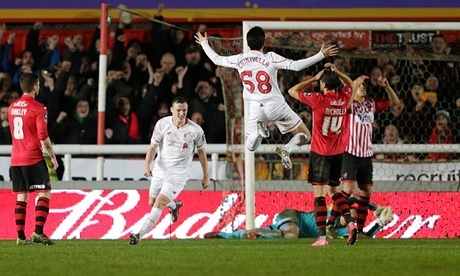 In Liverpool's favour though, whilst in possession, we were beginning to trouble the Exeter goalkeeper. A string of corners from Charlie Adam about 15 minutes in were a danger to deal with for the home teams defence. Liverpool face Exeter tomorrow night at St James Park. A slightly smaller capacity than the matching named North East stadium, it should be an interesting fixture for the home fans tomorrow seeing the stars of Dalglish's side on their turf. For those of you that don't know much about our opposition tomorrow i will try to give you a quick round up on The Grecians. Exeter are currently in League One and last year they finished in a respectable 8th place. The club itself is owned by the fans through Exeter City Supporters Trust. Their top goalscorer from last season Richard Logan nabbed himself 11 goals by the end of the 2010/2011 campaign and is still with the club. In terms of past meetings the clubs have only met on four occasions. 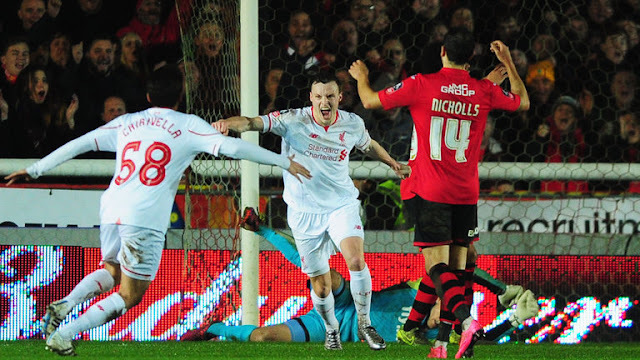 Liverpool have been victorious in all four matches one of which saw a 6-0 win for the Reds.